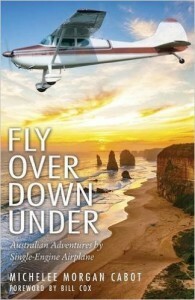 The following is a guest post by Michelee Morgan Cabot, author of Fly Over Down Under. If you would like to write a guest post on my blog, please send me an e-mail at contact@cecilesune.com. On the wide South Australian desert horizon, flat and vague, slowly appeared low undulating mounds. Nothing spectacular – but the nearer we got, some appeared strangely, smoothly, cone-shaped. Mysterious piles like giant anthills – but not. As we descended to land, we saw that these regularly spaced cones each had a black hole in the middle, just like an anthill. Coober Pedy was a mining town, and darned if they weren’t tailings. Tailings? Tailings from coal mines we’d seen… discards from underground excavations. Huge hills of black. But these were tiny, whitish, and surreal. Like ants, workers digging below ground had hoisted the earth out and up a shaft to the surface, where each shovelful made an ever-growing, symmetrical hill. Our curiosity was hugely piqued… We peered with interest at the rough edges of this mining town as we circled over it. 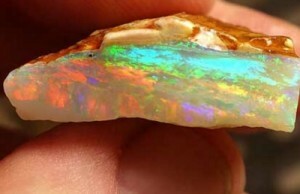 Since back in 1915, when as they were out walking an explorer and his boy spotted colorful rocks gleaming in the sun, Coober Pedy has been the home of the world’s best supply of opals. Opals are splendid gemstones containing a wee but critical percentage of water – gems of shimmering rainbows, so fragile they don’t last very well. You mustn’t let them dry out, or they’ll crack and splinter, fade and lose their beautiful color. Whirring our wheels down onto the hot macadam, we taxied to parking, there scooped up by our hotel rep. Oh, the famous underground hotel. The desert heat of Coober Pedy was hell-fire hot, but folks had long since figured out a way to beat that – they burrowed like rabbits beneath the surface, making cozy, earth-cooled homes. (Soldiers returning from war to work, back in 1916, brought the concept of dugouts to the new town, which morphed into underground living.) There was even a lovely below ground chapel for Sunday worshipping. And similarly, in time, they had carved out a terrific cavern of a hotel, full of handsome wandering tunnels chiseled out of rock, leading to cool well-appointed cave bedrooms. Sometimes, if you squinted closely, you could spy a speck of opal in a tunnel wall. We happened to be in this unique desert town on ANZAC Day… as important a day to the Australians and their war veterans as our Memorial Day is to us Americans. ANZAC. The Australia and New Zealand Army Corps, those who fought in the horrendous bloody battle of Gallipoli. We watched from a shady restaurant porch as a wiry little handful of aged soldiers strode in the morning down the middle of the street, proudly marching to a brass band. It was so poignant. The straggling little parade evoked the universally felt pain and compassion for the failures of the human race to be peaceful. And an ache for the wreckage of lives brought by this failing. In later years a song was written about this 1915 battle, called “And the Band Played Waltzin’ Matilda.” Please find it on YouTube, and listen. It is powerful. It was an interesting stopover, with the chance to purchase the coveted opal. Got one, love it, never wear it. Afraid of its drying out. Bah. Such is a woman’s life. About the author and her work: Michelee Morgan Cabot’s Website. Born a Texan to a career Air Force officer and very Southern mother, Michelee spent her impressionable early years all around the world, on a path that brought her to a first marriage at twenty-one. Two children later, with useful time served volunteering at hospitals and museums, she found her way to her first flight lesson. Flying can be liberating... In the ensuing nearly fifty years, besides becoming a C.A.S.A. volunteer, she found her excellent new husband Hal, became a restaurant reviewer, managed a flight school office and logged more than 5,000 hours of flight time, including these in Australia. 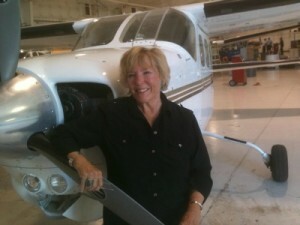 She holds a commercial license (both single engine land and glider) with instrument rating, and a tow pilot endorsement, and has been active in several aviation organizations, including the volunteer Airlifeline (now Angel Flight).